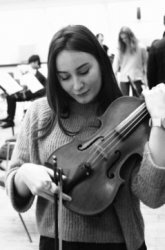 Evie studied music at university in London and has been playing violin and viola for seventeen years. She is interested in a broad range of music, which she hopes to share with students of all ages and abilities in their lessons. As a performer, Evie plays in various settings - folk bands, jazz trios, rock, pop and indie groups, as well as more typical orchestral and classical ensembles. In London she has played at notable venues such as Royal Festival Hall, the Purcell Room, Clore Ballroom, Buckingham Palace, Southwark Cathedral, Indigo o2, and Cafe OTO. Her own musical interest currently lies in baroque and contemporary music, as well as experimental improvisation and live electronics. Evie has been teaching a broad range of students for the last three years: those who wish to take grade exams, those looking to explore folk and improvisation, expand their repertoire, or brush up on technique. She also currently teaches group violin classes at a primary school in London.